Grand Central Publishing, 9781455572854, 368pp. Claire Petrenko always knew it was coming. Breast cancer has already claimed both her mother and her younger sister. Now, as she cobbles the pieces of her life back together, the devastating family legacy returns, and Claire receives the same diagnosis. So when her old friend Jenna Hogan suddenly shows up at her door-like a fairy godmother offering to grant a wish-Claire seizes the chance to revisit her past . . . and salvage her future. What begins as an impulsive trip soon becomes an odyssey as the women cross the country, gathering friends as they make their way to their childhood home of Pine Lake. 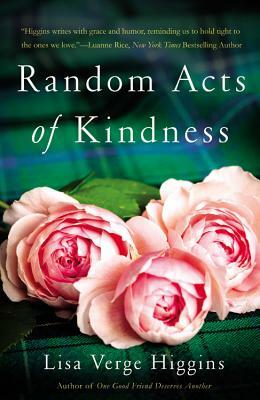 There, they discover that Jenna's random act of kindness has rippled out into the world like a stone dropped into a pond, surging back to transform all their lives in ways they never expected. While studying for her Ph.D. in chemistry, Lisa Verge Higgins wrote and sold her first novel. Now an author of fifteen books, this opera-loving mother of three has been twice named to Barnes & Noble's General Fiction Forum for their top twenty novels of the year. Her stories about women's lives and women's friendships have been described by reviewers as "joyous, uplifting life lessons" that "inspire us to focus on what's really important in our lives." When not writing stories, Lisa works as a reviewer for The New York Journal of Books. She currently lives in New Jersey with her husband and their three teenage daughters, who never fail to make life interesting.